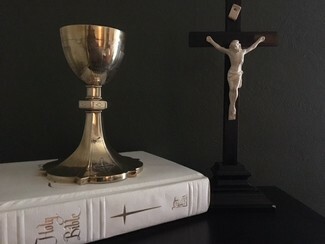 Thank you for signing up to receive the Traveling Chalice in your home! Please keep it for one week and in that time pray for vocations in our parish, diocese and the Church as a whole. You will find prayer cards included with the Chalice as well as the names and pictures of those in the Madison Diocese who have answered God's Call of Service. When you sign up below please indicate the MASS TIME you will be attending that weekend and also if you would like the priest to ANNOUNCE your reception of the Chalice. We do encourage you to accept this Chalice publicly during the Mass as a testament to the importance of praying for vocations! Otherwise you could receive it in the sacristy after Mass. Please return the Chalice to the Parish Center by noon on the Friday that ends your week. Contact the Parish Center with any questions at 608-837-7381.